The text markup annotation toolbar is only visible, when the user selects a already created text markup annotation. Specifically access the opacity slider for text markup annotations. Specifically access the color-picker for text markup annotations. Wraps the color picker for single colors that is used to change the color of an annotation with only a single customizable color. An individual color option. The class is active, when the color is used on the current annotation. A single color swatch. Changing this color via CSS will not change the annotation when the color is selected. Blend mode dropdown selector toolbox container. Specifically access the different blend modes for text markup annotations. 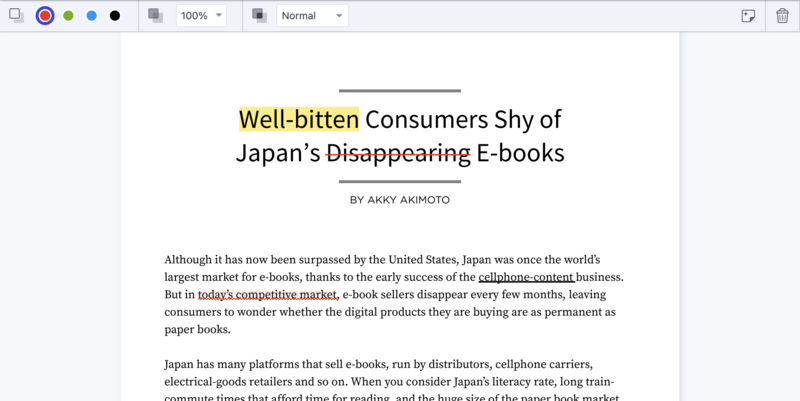 The button to delete a text markup annotation is always visible, because the toolbar is also only visible for already created text markup annotations. The highlight annotation in the document. It's styled by the properties of the annotation. The strike out annotation in the document. It's styled by the properties of the annotation. The underline annotation in the document. It's styled by the properties of the annotation. The squiggle annotation in the document. It's styled by the properties of the annotation.